Good morning :) Have you had your breakfast? The thing about life is, when it gets busy and the going gets tough, it’s just very easy to go with the current and get caught up. And when you get caught up in life, you tend to lose sight of what is important to you. The simple pleasures you take for granted which suddenly becomes a luxury you can’t afford or keep missing. For me, there is one thing that I miss or I tend to forget especially when I am busy working. Don’t laugh, but its breakfast. It’s the most important meal of the day, but it’s the first thing I postpone or cancel if I have a very important meeting or when I’m rushing for work. And after a while, skipping breakfast becomes a habit. To me, breakfast is not only the most important meal, it’s also the most important time for me to plan my day and week ahead. Nowadays, I try to keep a conscious effort to have my breakfast. But, back when I lived a very hectic and unhealthy lifestyle, I would never have the time to have breakfast. Either because I was always in a rush or because there were just too many things to settle at work in the morning. There were even times when my mother had to resort to packing some food she prepared for me to eat in the morning. But more often than not, I will only get to eat it during lunchtime or even during dinner. I know a lot of people eat nasi lemak for breakfast here in Malaysia. However, nasi lemak makes me sleepy. So I don’t usually eat nasi lemak for breakfast. It will be something I will eat for lunch or dinner. But for me, I just enjoy having simple breakfasts. At the very least, some fresh fruit juices to start my day. 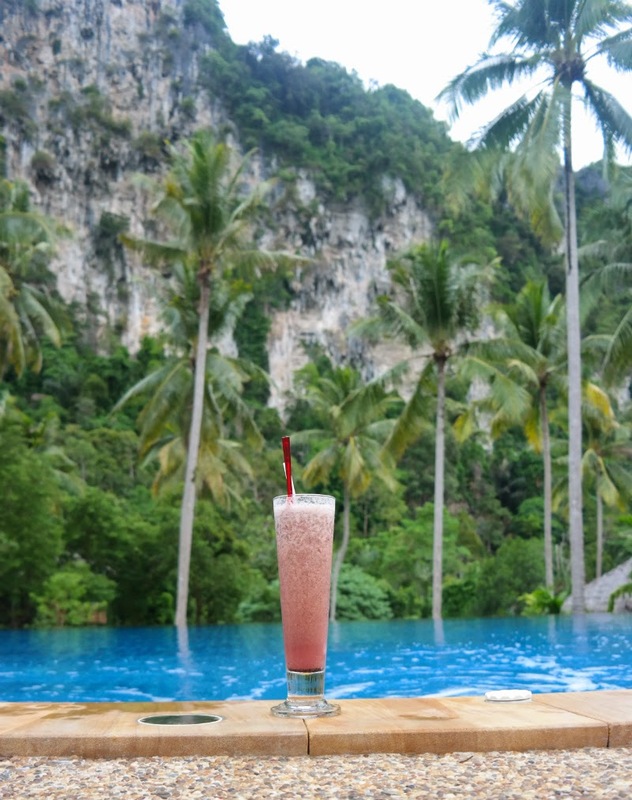 This reminds me when I was at Krabi a few months ago with the husband drinking my fresh fruit juice while dipping and swimming in the pool with a super gorgeous view of nature. Sometimes, like this morning, I may not have the time to have a big or proper breakfast, but I also enjoy simple breakfasts too. Just a cup of hot chocolate and Jacob’s cream crackers biscuit is fulfilling in itself. It’s just like the time when I went on a vacation at Krabi. I put a pause button on life, just enjoy myself in the moment, and just take a second or two to appreciate the simple pleasures in my life that I tend to overlook when I’m too caught up with work. We need to do this once in awhile. Most people tend to overlook the importance of breakfast, but making time for breakfast gives you that little joy, that simple pleasure. Just like Jacob’s cream crackers. We have a stock of Jacob’s biscuits at home as a light snack. My husband loves the cream crackers with his coffee and I’m almost converted. Just as well, Jacobs is running a photography competition to capture the simple pleasures in life. 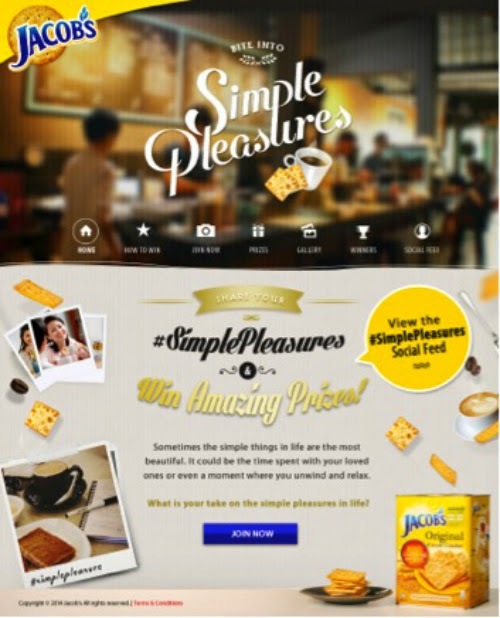 If you are using a desktop, just register in Jacobs Facebook tab, and submit photo depicting your moment of Simple Pleasure with the hashtag #simplepleasures. Once submitted, you can share and get friends to like in the FB tab to win prizes. If you are using a mobile, register in Jacobs Facebook tab, and take a “simple pleasures” picture with Instagram with the hashtag #simplepleasures. Photos will be pulled from the hashtag and saved to Jacob’s Fb page. Then get your friends to like the photos in FB tab to win prizes. There will be a grand prize for the most creative caption and photo will receive the grand prize of a 1-year supply of Jacob’s products worth RM2,400 cash and a Philips Saeco coffee machine. A total of Thirty (30) photos will be selected for 6 weeks and five (5) winners will be selected to win the weekly prize of Jacob’s products worth RM200 based on votes. So get your camera out and start snapping the simple pleasures in your life! If you want to know more about the competition, just head to Jacobs Facebook page. Looks interesting, I like Jacobs. Cicah biskut dengan air koko panas, bestnya. Selamat diet.